Marc Megna played in the NFL and coached pro athletes after he left the game. Now, he's an elite trainer and fitness model. Follow his fitness plan! Marc Megna was a clumsy kid. He was lazy, insecure, and awkward. He didn't want any part of exercise. He was not a great athlete, and he grew overweight because he didn't take part in competitions with classmates. He avoided all athletic challenges until, one day, with a little help from his family, Marc realized that if he worked hard enough, he could accomplish anything. With coaching from his grandfather, the remarkable support and guidance of his mother, an unbelievable work ethic, and a phone call one Saturday night, Marc Megna became something he never thought possible: a pro athlete. 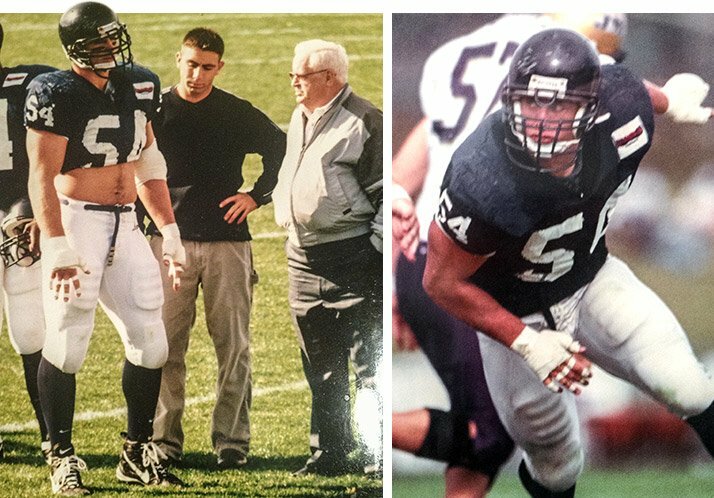 His journey took him to college, the NFL, and NFL Europe. He became a performance coach and is now one of the most respected trainers in the business. This is his Fitness 360. Like most teens in search of athletic inroads, young Marc Megna needed guidance. He was tired of sitting on the sidelines and avoiding social sports. He asked his grandfather, Abe White, for help. White was training local bodybuilders for competitions and once trained Jr. Mr. America Everett Sinderoff (1946). He took young Marc aside and taught him basic bodybuilding lifts like the bench press, curls, push-ups, and sit-ups. "I enjoyed it very much," Megna says. "He made me feel comfortable, and I think that is everything. That started me on the path to health and fitness." White was one of three highly influential people who pushed Marc to greater deeds down the line. His mother, Pauline, was his first and greatest inspiration. She raised Marc and his brother, Michael. She worked several jobs, so she didn't have a lot of time to spend with her boys, but she made up for lack of quantity with quality time. "She was that person who told my brother and me: 'You can do whatever you want to do. Now, you're going to have to do the work. It's not going to be easy, but it will be worth it someday. You can do it.' She would always be there to support us." Marc Megna trains for strength, speed, agility, and power. His plan will build your physique and boost your performance. 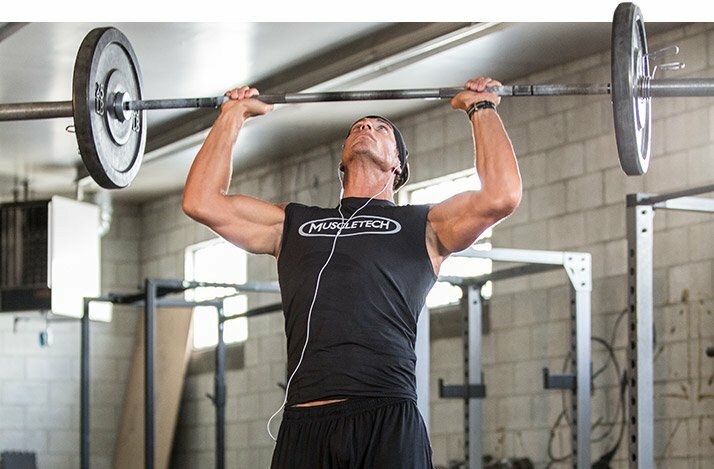 Train like a pro. Marc Megna didn't just wake up an NFL linebacker. He started training and eating for his goals as a teenager. Follow his nutrition plan to achieve your own dreams. If you choose to follow a program like Marc Megna's, then your body is going to get worked in the gym. Support your efforts with appropriate supplementation. Marc entered high school with dyslexia; he had to spend extra hours with tutors to be able to read and write well. As he had for the many other trials in his life, Marc buckled down and worked. This was just the beginning of the hard work his mother had mentioned. It translated to football, too. "I was just worried about making the team—forget about playing or starting," Megna says. "I was probably the only kid who was really going to the gym every day, lifting every day, running every day. A lot of people did those things, but not every day, all the time. But for me, because I wasn't an athlete that got me in the game, ahead of the curve." One day at practice, Richmond Spiders Head Coach Jim Reid approached Marc. He was there to scout another player, but Megna, a hard-working linebacker, stood out. Recalls Marc: "He said, 'You know you can play college football. Do you realize that? You can get a free education if you keep showing people how important this is to you and you give it everything you have every single day.'" Marc originally wanted to join the Marines, but he dropped that goal for an emerging desire to go to college. "When he said that to me, all of a sudden it was a reality," Megna says. "I knew it was possible because someone else saw it, not just me." Megna was offered a scholarship to play for Richmond. Marc chose the Colonial Conference University because Reid had such great energy. His mother told him he had to go, because it was the only college that really wanted him. University life isn't all fun and games. Athletics take effort, but academics presented enormous challenges for Marc, who still struggled with learning disabilities. When he first got to college, his GPA was 1.6. For the first time in years, he contemplated quitting and forfeiting his scholarship, worth $50,000 a year. "My mother wrote me a long letter," Megna says. "I saved that letter and have it saved on the desktop of my computer. The premise: dream big and never quit. She was telling me that I just had to hang in there. If you hang in there, give it everything, you're going to be surprised where you finish." The letter turned things around. Marc graduated with a 3.0 GPA and earned a bachelor's degree in sociology. Of course, the football side of things brought its own challenges. Marc was a ripped freshman linebacker, 219 pounds and prepared to fly around the edges at the second level. When he arrived on campus, he was told he'd have to make a fundamental switch. "[Coach Reid] told me I was going to be a defensive lineman," Marc says. "And it wasn't as an end; it was nose guard. Those guys weigh more than 300 pounds. I said, 'Coach, I can't do it.' He said, 'I don't ever want to hear that word out of your mouth again. You can absolutely do it. Get out of my office.'" Marc steadily put on the weight to handle his position. He went from 219 pounds to 230, to 240, 250, and then 260 pounds. He grew and lifted weights, becoming a stronger athlete. He entered college benching 300 pounds and left benching 450; he could power clean 415 pounds and squat 700 pounds. "I wanted to be the very best in the country at this position," Megna says. "If that means tackles, if that means sacks, if that means productivity, energy … When the NFL scouts came around, they said, 'Well, he's really not that big, maybe he can't play defensive line, but he can play linebacker.'" When the 1999 NFL draft came around, Marc got a phone call on day two in the draft's sixth round. He picked up the phone and said, "Hello, this is Marc Megna." The voice replied, "Marc, do you know who this is?" Marc knew who it was, even though he'd never talked to the person before in his life. "This is Bill Parcells from the New York Jets. We are thinking about taking you with this next pick. How do you feel about that?" Marc tried to keep his voice steady and tough, but he was crying. He felt great about it. "Can you play linebacker?" Parcells asked. "Can you play special teams?" "Can you rush the passer?" 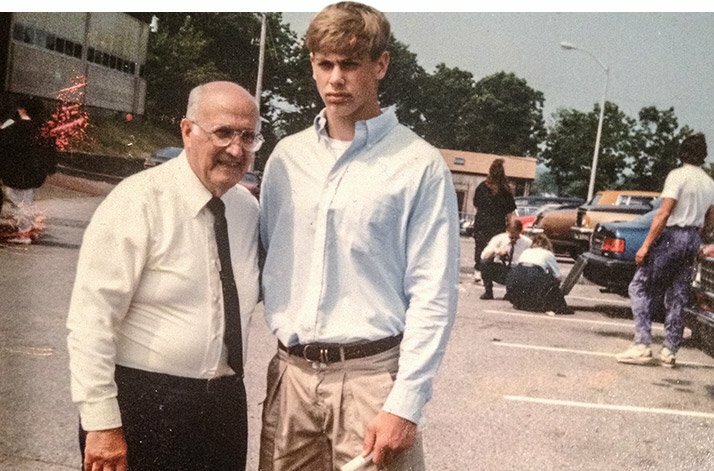 "Welcome to the New York Jets," Parcells said. The Jets selected Marc with the 183rd overall pick of the 1999 draft. They wanted him to play linebacker but gave him no promises. Most of the players drafted never play a down in the league, but those with enough moxie and drive usually end up playing somewhere. "It was one of the greatest moments of my life," Megna says. "I worked my whole life just to hear that I was good enough to do it. I went into camp with the Jets and I realized that not only was I playing a position that I hadn't played in four years, but the guys who were playing my position—Marvin Jones, Mo Lewis, James Farrior, Brian Cox—were allAll-Pros. I was a noseguard from a Division I-AA school who hadn't played the position in four years." The challenge was simple: play hard, re-learn how to play linebacker, drop weight, get stronger, learn the system, play harder, work harder. The upgrade in physicality from the NCAA to the NFL is severe, like a steady wind becoming a raging tornado. Marc was overjoyed to be drafted, to be in camp, but this was just the first bump in his professional journey. Eventually, Marc was released from the linebacker-heavy Jets, but he landed in New England to play for his hometown team. He would play under both Pete Carroll and Bill Belichek with the Patriots. Belichek, who would lead New England to five Super Bowl appearances, had been the Jets' defensive coordinator under Parcells, so he was familiar with Marc. "He liked my game and the way I worked," Marc says. "He knew at the very least that I wasn't going to embarrass anyone and I was going to be a solid component of his team, even if I was a reserve or special teams player." Over the next six years, Marc's whirlwind professional football career took him from New York to Boston, Cincinnati to Spain, Germany, Boston again, and eventually to Montreal, Canada, where he finished his football career playing in the Canadian Football League. Now that his playing days are done, Marc shows other athletes what it takes to stick to pro teams. He provides private personal training now, but he spent years working at the Pete Bommarito Performance Center, where he coached more than 300 professional athletes from all sports. He looks for clients who share his ethos for effort in training. "I think you attract what you are," Megna says. "[My clients] love to train as much as I do."